Laser hair reduction is the process of removing unwanted hair by means of exposure to pulses of laser light that destroy the hair follicles. 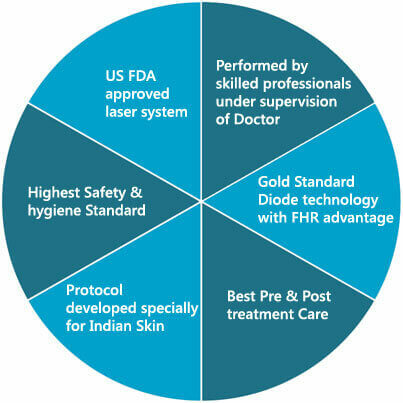 It had been performed experimentally for about twenty years before becoming commercially available in the mid-1990s.At AKS Clinic Laser Hair reduction uses US FDA approved Gold StandardDiode Technology with FHR advantage which for over ten years has been tried, tested and has shown wonderfulresults on Indian skin. Dermatologists use lasers to remove unwanted facial and body hair safely and effectively. However the most common mistake people make is that they assume all lasers used for hair removal are the same. Lasers today differ greatly and therefore it is important to know which laser technology will be best suited to your skin. The treatment requires multiple session for complete hair removal. During laser hair reduction, a laser beam passes through the skin to an individual hair follicle. The intense heat of the laser damages the hair follicle, which inhibits future hair growth. 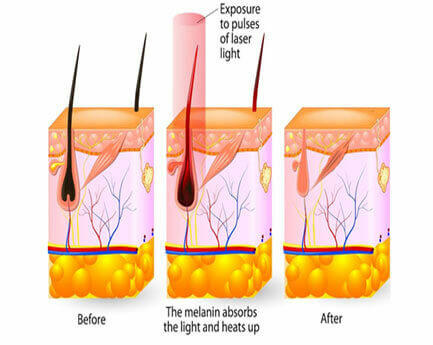 Laser hair removal is most effective for people who have light skin and dark hair. Both men and women seek laser hair reduction to get unwanted hair removed. It is commonly done on the side burn, upper & lower lip, chin, ear lobe, face, neck, nape, shoulders, back,underarm, abdomen, buttocks, pubic area, bikini lines, thighs, breast, arms, legs, hands, and toes. So come experience Quick, Safe, & comfortable laser for permanent hair reduction at AKS, one of the best laser hair removal clinics in Gurgaon, Delhi (NCR).